The original was a game that even Electronic Arts admits was an "abomination". This game's crowdfunding campaign was, let's be honest, a little weird. But whatever! 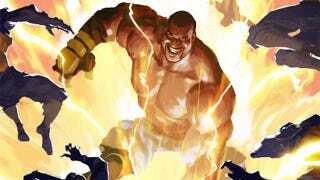 A second Shaq-Fu game looks like it's actually happening. The project passed its funding goal earlier today, developers Big Deez confirming that work is underway on both consoles and PC. Given Shaq's wealth (making the need for public money a little weird) and the fact that, cult status aside, the first game was garbage, this is going to be an interesting thing to keep an eye on. Especially after seeing this image of a cyborg Arsenio Hall. Note that one of the backer rewards - at a cost of $35,000 - was for Shaq to come and DJ your party. And someone paid for it.